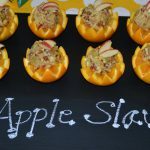 Apple Slaw in Orange Cup makes a pretty presentation with bright orange halves filled with a tangy but sweet gala apples, raisins, pecans, honey and orange juice slaw. In food processor with grating disc, grate apples. Place grated apples in mixing bowl. Add pecans, raisins, juice and honey. Stir to combine. Scoop apple slaw on top of orange cup.